Fun facts & history for children from America's Story, U.S. Library of Congress. Also try "Meet Amazing Americans" from the top menu to meet Mark Twain, George Washington Carver, Lewis & Clark, and others. 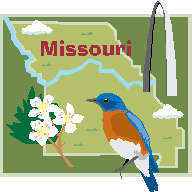 Formerly known as Virtually Missouri, this site includes collections of historical digital images of photographs, maps, documents, and other materials from library, museum, and archival collections throughout the state. Includes links to Missouri Revised Statutes, legislator lookup, joint bill tracking, House and Senate Hearings Schedule, etc. Includes a link to unclaimed property. Includes Missouri wineries, varietals, trails, and more.